How do you make a local (LAN) server in minecraft? I went to multiplayer and pressed "New Server" I entered the name I want it to be and the address. I pressed done but it said "hostname not available"
"New Server" doesn't create a server; it just lets you add one to the list of servers you connect to regularly. To create a server, you have to run the server executable, "Minecraft_Server.exe" or "minecraft_server.jar". Detailed instructions can be found on the minecraft wiki if you need more help getting set up or run into performance issues. If you are running the server on the same machine as the client, you can connect to "localhost" as the server address, or your own IP address. If you want to create a LAN server to play with your buddies connected on the same network, create a single player world, then from the pause screen, select 'Open to LAN', as pictured below. 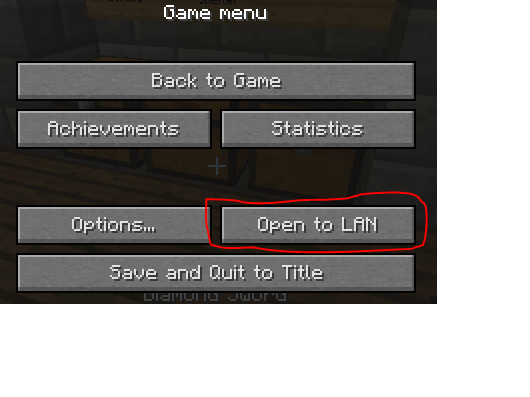 Go to your game menu and press "Open to LAN". Next, it will show your IP address. Write down the IP address, and go back to the title screen and click on multiplayer. Then, click on "Add server", name the server and then type in the IP address. Locate your local IP address. You can view that here: https://www.whatismyip.com/ Your local IP address is different from your external IP address, which is what people commonly refer to when they say your IP address. Your local IP address is used inside a private network to locate devices inside it, where your external IP address is an addressed assigned by your Internet Service Provider when you connect to the Internet. Start single player and click "Open to LAN" from the pause menu. It will print a port number, say 51831. If your local IP address is 172.16.42.182 then join the two with a :: 172.16.42.182:51831. Share this address with your friend, and ask them to connect use "Direct Connection" from the multiplayer start menu. How to play with friends in my single player worlds? Can't set up a local LAN server on Minecraft 12w25a? How do you name your Minecraft server? How to host a minecraft server with minigames for a LAN party? How to start a multiplayer in minecraft on local hotspot?